2) What sort of events in his life occurred between the ages of 20-22? Please give astrological reasoning for all answers. "Intuition' is not an astrological reason. Answers may be as involved or as superficial as anyone wishes, but all must be accompanied by astrological reasoning. His Mercury's antiscion is 17 degrees Cancer 48 minutes, in his tenth house. It squares his Mars' antiscion in 18 degrees Aries 34 minutes in his seventh house, close to the eighth house cusp. Mercury making tight, within about one degree, hard aspects like a square, to Mars usually indicates high intelligence. At about the age of 22, his Solar Arc progressed Midheaven was conjunct his tenth house Mercury's antiscion. Solar Arc progressed angles usually have their effect from one degree, or one year, before exact. A completely wild guess is that maybe he was collaborating with a young male colleague (Mars' antiscion in the seventh house) on some prestigious intellectual or scientific career. Lots of friends associated with his career. As the Ascendant and Midheaven are in similar degrees of squaring signs, about the same time around age 22, his Solar Arc Descendant would be conjunct his natal Mars' antiscion in the seventh house. Maybe this indicates a young male competitor, or colleague? His tenth house Sun is 45 degrees semisquare to Jupiter in Leo, so an extraverted, warm, generous person who impresses people, which he uses in his career. Maybe passed a scholarship in his early teens as converse Solar Arc Midheaven was conjunct his ninth house Mercury and converse Solar Arc Ascendant was conjunct his twelfth house Mars. The twelfth house Mars seems very karmic, maybe showing intellectual talent from a past life that was hidden. I didn't spend a ton of time on this, as I am getting ready for work. I think the emphasis on asc ruler in Gemini square Mars in Virgo in the 12th would make a sharp, quick and critical mind and someone who is maybe very critical of others and likes to challenge people and is difficult to get along with, especially since Mars is received by the 1st lord and is in the 12th. Normally you do want the dignified planet to revieve a planet that is not doing so well but when the asc ruler does that with a malefic, it can cause some serious issues (an extreme example is Ted Bundy). I would even say they may be verbally abusive but maybe not physically since Mercury is dignified and in the 9th and they otherwise don't have emphasis on that kind of behavior, especially with Sun and Venus in water and Moon in Aqu in the 6th and a dignified Jupiter. They could also have mental health problems and be accident prone, though. Moon in Aqu in the 6th is someone who can deal with a lot of stress in their life and take it inward, causing physical manifestation, but at the same time they crave stress. I have a little bit of a similar influence with the Moon. I also have Mercury in hard aspect to Mars (conjunction) and I can be argumentative and like challenges (such as these posts). First thing I noticed is ASC ruler is in a pretty tight square with the 8th lord in the 12th and receives that Mars, while Mars does not receive back and is a difficult malefic - out of sect and lacks essential dignity. I would need to see transits, progressions and other methods to check if that was activated in a bad way around that age to be sure but his chart doesn't seem to indicate a super early death with the Sun in the 10th in a day chart and I think Venus might be the alcoccoden and in aspect to Saturn but angular so maybe they do die relatively young but 22 may not be right. In the age group of 20-22 it would place emphasis around the 9th thru 11th houses in profection so I am guessing you are asking about a success in their life, since they do have Jupiter in Leo in the 11th, which can show accolades/career or academic emphasis, and a very angular Sun in the 10, but I would especially want to check that the 10th house Mercury year profection year was not emphasizing the Mercury-Mars square, since it could emphasize accidents, 12th house issues (imprisonment, etc.) and health issues like neurological problems or mental health issues. I have Jupiter in Leo and we are often said to be a bit garish in our appearance and like attention/ be flamboyant and dramatic. I am not sure if he is that way but it is possible. It would also help him be a bit less abrasive with that Mercury-Mars influence, I imagine. Fleur - would you mind posting his birth year? I don't have time to figure it out with ephemerides and would like to look at those 3 years better. I am confused why we would he asked to predict something specific regarding timing without the data. I am a big fan of basic profections. It seems like the 20th year would be a Venus year and 9th house profection. Venus years are often pretty easy and good, and his Venus isn't that bad. He has Venus occidental and in a water sign, although out of sect and under the beams. 21st would be 10th house Mercury year but then that also puts the Sun and Venus in the profected 1st, which can be pretty positive too. The 22nd year would be 11th house and his Moon isn't great but Jupiter is in the profected 1st. So there is kind of a mixed bag but overall maybe positive years. 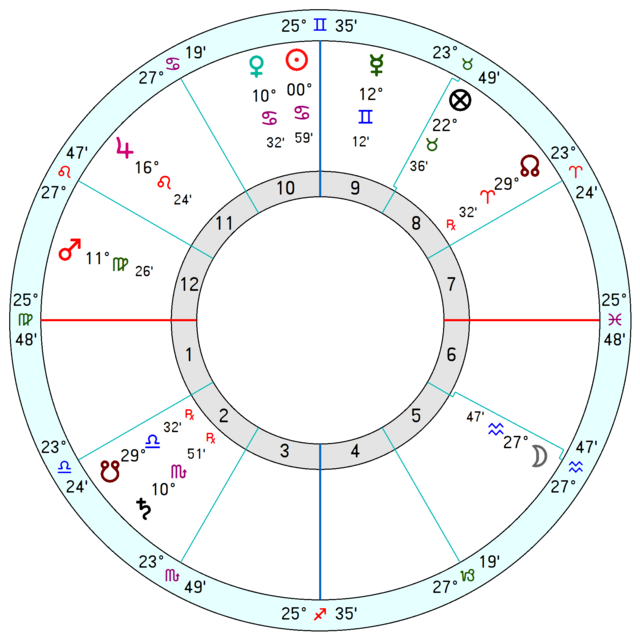 If someone were to ask about something like a Mars year or 12th house profection for him, then I would think it could be troublesome, especially if other indicators suggested it. It would take me ages to even guess at his birth year, just from Saturn, Jupiter and the Moons Nodes, and that would probably defeat the purpose, as if he is famous people could easily look him up. I am assuming that the Solar Arc of his Descendant to his natal Mars' antiscion at around age 22 was mostly beneficial to him, and the Solar Arcs of both chart angles to his Mars Mercury square simply activated the high intelligence implied by that square, and made them manifest in the world. But if other transits were also affecting his Mars, a different picture could be shown. Sorry, I thought you did for your reading but you must have done it manually. If it is a celebrity again, then doesn't it defeat the purpose of the complaints people keep making about looking people up? I would rather look at a family member with data. I did not notice that Mercury is separating from Mars and applying to sextile Jupiter, so it is also helped quite a lot by that influence. Jupiter does well in Leo, especially in the day and in the 11th. It would increase education, eloquence, worldliness/ liberaltiy, wisdom, travel, language, etc. One thing I know about my own Mercury-Mars issues is that we often think too quickly and jump to conclusions a lot but, having a superior in aspect to Mercury helps it to be more sort of ponderous, or at least more self aware of its problems. Still, as much as Jupiter aids, it still does not get rid of completely some of the negative effects that a malefic can bring on either the person's character itself and/or their life somehow. It also does help to have the lights (Sun and Moon) in favorable aspect like here with the trine (out of sign but within orb) because it often represents a loving home life, and parents that care about one another, which can influence a person's life for the better and make them feel more whole. Still, Moon in the 6th, especially in a sign of Saturn, does suggest some emotional problems, such as detached and repressed or judged emotions. Aquarius is a sign that can be good at objectively seeing something but isn't always great at relating on an emotional level. I have Moon square Saturn in the 6th and I am a very detached person and am excellent during a crisis but when people come to me with personal problems or are emotional/crying, etc. I don't know how to relate to them and I can see something like that being a little bit likely with this person, although they would be caring and maybe a bit nurturing with Sun and Venus in Cancer - still, it might be hard for them to convey it, especially since Venus aspects Saturn. I often think of the 11th as a lucky sort of house and people with good planets there often have more good than bad in life. One of my sisters has Jupiter in Aries in the day there and she is a fairly upbeat and happy person, in spite of a lot of trouble elsewhere in her chart. A short stature with melancholic and mentally disturbed personality/ a serious looking depressed person. May also be the youngest of all. Chart shows lack of mother's affection (4th in the 12th). There is a possibility of losing father between 20-22 and suffering due to chronic respiratory ailment is also indicated. comforts evade him (4th & 7th with 12th). First: For some reason I was not getting notifications of posts. Sorry about that. I'll check back more often. Some good stuff here, but I never said this was a friend or non-celebrity. And, understandably some of the characteristics are off despite the astrological reasoning being good. So here is a kind of hint. He is or was a celebrity in the 19th century, but the odds are most people haven't heard of him. Let's look a a few comments. A completely wild guess is that maybe he was collaborating with a young male colleague (Mars' antiscion in the seventh house) on some prestigious intellectual or scientific career. Half right. The 7th has meanings other than spouse or partner. So the reasoning is good, but again the precise nature of the event is off. It is not reasonable to expect the astrologer to nail this one due to the multiple meanings of the 7th house. Great effort. I think the emphasis on asc ruler in Gemini square Mars in Virgo in the 12th would make a sharp, quick and critical mind and someone who is maybe very critical of others and likes to challenge people and is difficult to get along with, especially since Mars is received by the 1st lord and is in the 12th. Not bad. Substitute "compete with people" for "challenge people" and you're onto somthing. For the record, he was VERY intelligent. OK this is a modern astrological take, and it does apply to this native, but the problems turned out to be very severe, probably congenital, but in his day, it was believed his problems were caused by an external event. A short stature with melancholic and mentally disturbed personality/ a serious looking depressed person. Short yes, even for his day. Mentally disturbed, yes later in life. He did not die or exhibit mental problems at ages 20-22. That's moving in the wrong direction. May also be the youngest of all. Don't know I'll look that up. Chart shows lack of mother's affection (4th in the 12th). There is a possibility of losing father between 20-22 and suffering due to chronic respiratory ailment is also indicated. Traditional astrology has the father or the family signified by the 4th. To the best of my knowledge there were no serious family issues. He was born to a well-to-do family. I'll try to find information about the mother. NOTE: Posting the data would make it ridiculously easy to find out who he was even without knowing him. That is not the purpose of the exercise. The purpose is a blind reading of a chart to learn what does and doesn't work in this instance. If something doesn't work, then go back and try to figure out if there was something missed. This is the traditional forum, so things like the hypothetical planets really don't belong in the delineation. Astrology was practiced for thousands of years without even the three outers, so we can do that, too. Remember, "Guess The Native" is not the point. The point is application of technique. 2) Intellectual accomplishment in his 20s. There is one more part of this that fits the astrology, but I can't imagine anyone would get that. Actually this is damn good and an excellent outline. The other major events in his life, will be discussed, but let's see if anyone can spot them. I am curious about the astrological reasoning for "short stature." I said he had an accident because at 21 Mars should be rising by secondary progression. But I didn`t calculate progressions,had no time. The native had two older siblings and one younger. I can't find anything that says his mother lacked affection for him or that he wasn't aware of it. However I haven't been able to find much of anything about his mother. Also I found nothing regarding a respiratory ailment. That doesn't mean it didn't happen. The concentration of biographers has been on his mental illness, though. I guess if you are asking about other aspects of their life then 10th lord Mercury in the 9th in Gemini with Jupiter would obviously be something that involves mental pursuits but you already mentioned intelligence and that is pretty obvious. Sort of similar to TT's chart recently, the influence of Jupiter and 10th lord in the 9th could show things like working in education, though they don't have Jupiter in the 10th or ruling the 7th, just influencing it, so I don't think they are a teacher in this case. I have Jupiter in Leo in the 2nd ruling the 10th and I have worked in education and government, and I also have Mars influencing career. They likely are well educated but sometimes Mercury in Gemini can be self educated because the person learns easily. As I often mention in the horary forum, Mars influencing the 10th lord or the 10th, especially in a negative way, also can lead to being fired or the person leaving their job(s), such as due to lack of satisfaction or just boredom. I have Mars in the 10th and have gone through dozens of jobs - not fired but just bored or looking to do other things. Mars cuts things too short and makes hasty decisions - the opposite of Saturn, which often takes its time or just too long and stays in work it hates. Also, as someone with a mutable angle myself on the MC, it can indicate dual jobs that have multiple roles or doing two different jobs at the same time. For myself, I either work while in school or have two jobs or jobs that have two roles. I don't think I have ever had a job that didn't fit that criteria or if I did it did not last long. 7th house Pisces is usually prolific for marriage but Jupiter is in a barren sign, Moon is not great, Jupiter squares Saturn and Venus is in aspect with Saturn and under the beams and out of sect, so marriage is difficult, delayed or just denied. Normally 1st lord with 7th lord is good for marriage but Mercury is translating the light of the square from Mars to Jupiter, so that is not easy either. I am glad I got mental illness right. The problem with people who are very intelligent is that they do often suffer from mental illness but here it is very pronounced with the influence of Mars. I personally pretty much always find it unsettling to see an ASC ruler receiving a bad malefic with a Ptolemic aspect. I am not really sure what to make of their Venus ruled 2nd in the 10th with Sun but it seems to be another source of income. Maybe others have theories on Venus. SN in the 2nd can squander money but Saturn, especially fixed, there can be cautious and show steady income, such as from real estate, land, etc., so there is some mixed testimony there. I recently watched a video from Lada Duncheva on the NN in the 8th and she said those people are often self sufficient but still have to deal with needing money or resources from others in some capacity. She also said it shows some emotional problems, such as distrust and paranoia of other people's motives, since NN magnifies. Like debating or mind games? They don't seem very political but who knows. Definitely Gemini likes anything that keeps the mind challenged and the 12th likes to analyze problems of any sort. Sharing their knowledge with others in some capacity would make sense with Jupiter in the 11th with Mercury. The 11th is a group oriented house. I have a heavy 11th and I often think about groups more than the individual and he would gain energy from working with others and sharing his mental pursuits.